Summary: Farmer Brown has unusual cows. The cows found an old type writer, practiced typing, and typed him a request for electric blankets. Farmer Brown refused and got really angry. The next day the cows refused to give Farmer Brown milk. Farmer Brown was angry. The day after that the chickens were also requesting electric blankets. Farmer Brown refused and the next day there was no milk and no eggs for Farmer Brown. Farmer Brown was irate and sent an ultimatum to the cows through Duck. He demanded milk and eggs. The cows agreed to a compromise, they would surrender the typewriter for the electric blankets. The blankets were left outside the barn door, but Duck hijacked the typewriter and the ducks requested a diving board for the pond. 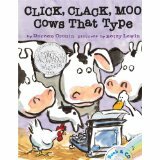 Literary elements at work in the story: One of the strengths of the book is the repeated refrain Click, Clack, Moo. The illustrations are lovable and add a lot to the story. This is a plot driven story that is easy to read and to the point. How does the perspective on gender/race/culture/economics/ability make a difference to the story? Farmer Brown is an older white guy that works hard for his living. There are no other human characters in the book, so there is not a variety of gender, race, culture, economic status, abilities/disabilities, or age. Why do you think Farmer Brown was angry at the cows? Give examples of what happened when Farmer Brown got angry. The cows engaged in peaceful resistance. What are some other examples of peaceful resistance? How did the cows return peace to the farm? How does compromise work in a situation? What do the Bible passages tell us about peace? This review was prepared by Union Presbyterian Seminary – Charlotte student Jessie Smith. Click, Clack, Moo Cows That Type by Storypath is licensed under a Creative Commons Attribution-NonCommercial 4.0 International License. Sorry, I don’t get it, and I wouldn’t use this book with children in either a home or instructional setting. It’s actually about labor relations, but (a) the cows themselves would suffer if they weren’t milked for even one day; (b) there’s no real negotiation or “compromise” shown, only mutual resistance and bullying. The scriptural ties are also very contrived. I’m all for whimsy, but against using animal characters in ways that make children more ignorant of reality. I both agree and disagree with bkswrites about Click Clack Moo. It is about community organizing to improve working conditions (labor relations) executed in a light hearted way. The lack of realism (cows have to be milked every day) for me is trumped by the practical wisdom of the story which deals with a world as it is, not as we would have it. I would read it to children in a heartbeat, maybe talk about civil rights strategies like the lunch counter sit ins or packing the Montgomery jail, noting that the universe may bend toward justice but sometimes it needs us to use our powers and convictions. I, too, would like more nuanced scriptural support for the story.